We believe that adding interactivity to your meetings and events should be affordable and stress free!. We offer day hire rates and long term rental options for our audience response systems, so whether you want to include voting for a 1 day meeting or a multi-date roadshow, we have a pricing structure to suit. When you rent a keypad voting system from us you also benefit from our expertise. We’re here to help you every step of the way. Our audience response experts can help you with question structuring and slide design as well as the physical element of setting up the system on site. Audience response keypads and USB receiver(s). Advice and guidance with question formulation and most suitable graph/vote types available. 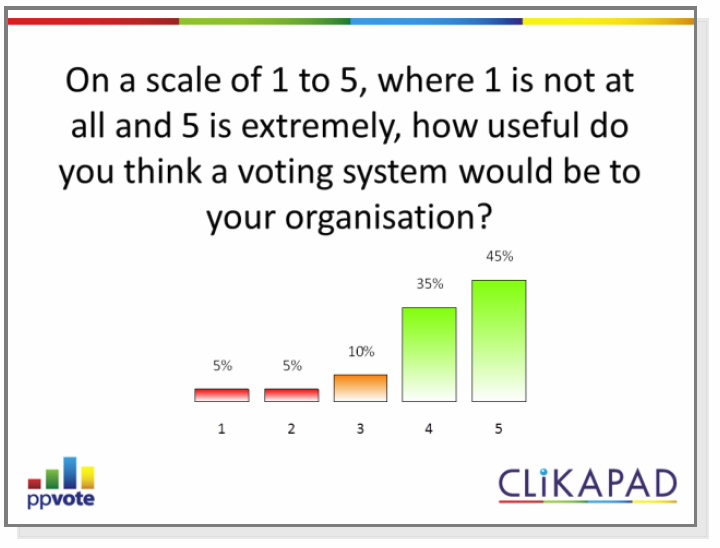 A professionally programmed voting slide set with no limit on the number of voting questions. 30 minute web coaching session to cover how to edit questions and run the live session. Delivery of equipment minimum of 3 working days prior to your event. An experienced Audience Response Technician to set up and run the audience response system for the rehearsal and event. 2 laptops (one to run the session plus one back up). A KVM Switch if required. A post event report which includes the voting data in Excel. For a keypad rental quotation or further information contact us.